Anna Schloff has been training and showing dogs for over 30. She has judged and taught many workshops in US, Canada, Holland, Japan, and South Africa and has raised Leader Dogs for the Blind and Paws with a Cause Service Dogs. She was a 4H leader for 15 years, started freestyle divisions in several Michigan 4H Fairs through being a member on the State 4H Board. 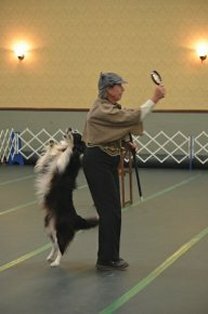 Anna also supports and promotes canine good citizenship by teaching classes and served as a CGC Judge for several years. In addition to teaching workshops Anna is presently teaching puppy, obedience, freestyle, trick, therapy dog, socialization classes, and foundation classes for multiple dog sports. Anna was one of the first board members for World Canine Freestyle Organization, helping and supporting Founder Patie Ventre creating the now worldwide titling organization for Freestyle. She is the past Junior Advocate, Club Advocate, and Entry Chairman for WCFO. Currently, Anna is the WCFO President/COO and Judges Advocate. On her 13th birthday Anna got her first puppy a rough collie and trained in obedience and just fun stuff. As an adult, Anna got her first Labrador Retriever and that started her interest in training and raising dogs. She has titled her labs in agility, freestyle, breed, obedience, and field in USA with breed and obedience also titled in Canada. Anna Schloff started dancing with her Labrador Lacey back in 1996 as the first freestyler from Michigan Lacey and Anna went to Kalamazoo, Michigan to compete in a Freestyle Fun meet at the UKC 100th Anniversary show. Anna met many other freestylers including Patie Ventre (Founder of WCFO). She became a member of the famous Pupperoni freestylers. Anna did many demos to promote the sport, learn, met many famous freestylers and was able to come back to Michigan to introduce and start freestyle. She is one of the founding members of the WCFO club Freestyle Fanatics. Her Labrador Retriever Danny was the youngest dog to pass MF Proficiency at 4 months old; Danny has had a few young dog title firsts, including Proficiency medals. Anna and Danny earned 1 brace title, 3 pair�s titles and HTM and MF Champion. Anna and Danny was the second dog to earn a beginner K9 Dressage title. Currently Anna dances with her Papillion Jack, her first small dog. They have their Rally excellent title, Beginner Obedience, Proficiency Bronze Bars and Medals in both Heelwork to Music and Musical Freestyle, and they are Musical Freestyle and Heelwork to music Champions. Anna and Jack have multiple Perfect Dance Partner titles in both Musical Freestyle and Heelwork to Music Divisions and they also have their Beginner Skit title. Jack is also a certified Therapy dog and loves working with people especially kids. 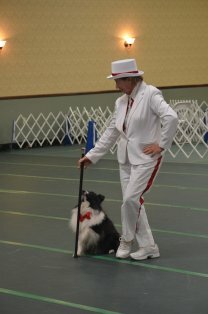 Jack and Anna are continuing to work in freestyle, obedience, and agility. Just recently Jack received his Advanced Trick Title. Anna also dances with her Irish Terrier Dublin. Dublin received his Novice Trick Title. 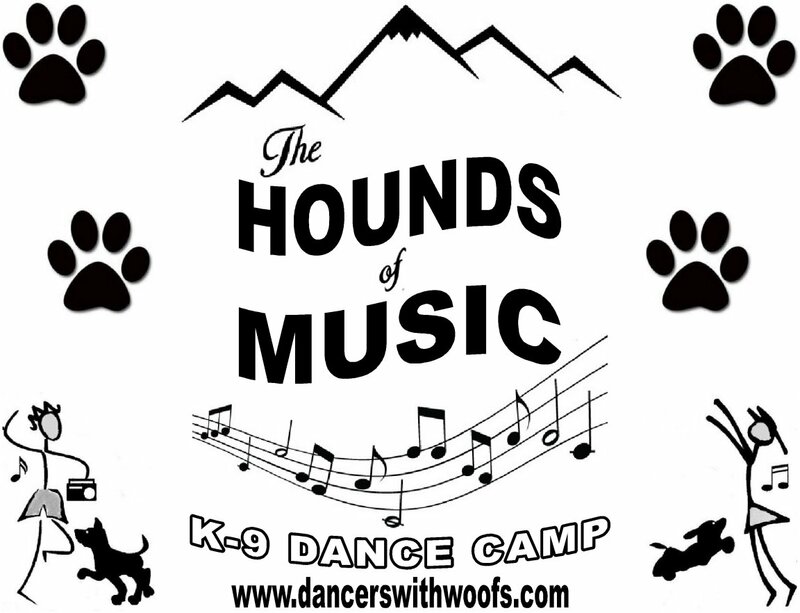 Anna just recently founded High Struttin� Hounds, a new WCFO club. Patie Ventre started Ventre Advertising Inc. in 1977. She has worked with pet industry clients, in promotion of products, sports events and event planning since 1977. Specializing in Professional Services and promoting joys of responsible pet ownership. In 1993, Patie Ventre presented the first organized demonstration of canine freestyle dancing at the Gaines Classic in Memphis, Tennessee. In 1999 Patie created WCFO Inc. with 13 other people. Patie loves that she created a dog sport that truly represents the spirit of sharing and bonding with your pet and with each other. Her dream is to see freestyle in the Olympics. Patie's freestyle training approach is very holistic. She trains the whole dog: mind, body and spirit. 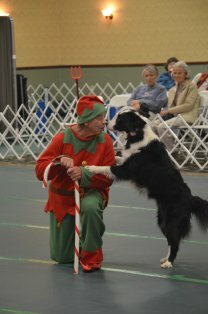 The core of her training and her performance celebrates her dog's joy to prance with mom, while entrancing the audience. Her techniques are upbeat and focus on fun for the dog. Each dog is unique! 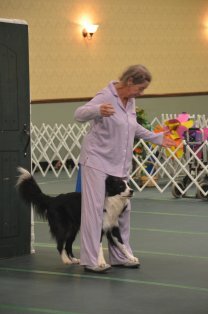 A mind-to-mind connection is obvious in Patie's determination to have her dogs succeed and perform moves that bring them joy. She is not a cookie-cutter, "you will do this because I say so" kind of trainer. True partnership is the message as she shares a training example. She tried teaching Dancer to roll-over. It is not her move as she hated having her underside exposed. This brings up another important issue: training moves and using the ones your dog loves. Patie does not use lots of treats in her training, explaining, she believes the personal interaction is very important to instill as a reward for focus and attention. If she can read their movements, there is nothing they cannot create together that is uniquely theirs. It is the sharing and bonding with our dogs and the fun we have! It is a stress reliever, too. She loves choreographing routines, selecting music, designing costumes and practicing, practicing--that makes us laugh! You can actually see when the light bulb goes off on their faces and they've finally got it! They know they understand and just want to do it over and over because they are so proud of themselves. A routine is done when it is done; it does not matter how long it takes to create it. The focus is on attention. It may take from three months to one year to create a routine to the level you like. Some routines are easier than others to create. Each dog has its own specific moves that turn them on. These moves are done beautifully, and naturally. A good team will capitalize on them. Sometimes an owner sees another team does a great move and then tries to do it with their dog and sometimes this does not work. The responsibility is on the owner to find the perfect moves that work with their dog, not try to copy everything successful they see in another team. Patie also loves to ski, boat, fish, jet ski, scuba dive and dance, dance, dance! Up on your feet, dog lovers! Catch the freestyle fever! Chances are there's a dog sitting or lying very close to you who is watching your face and trying to send you the message "Gotta Dance!" Kay Johnson has been dancing her entire life. She began teaching many years ago and opened her own dance studio in 1992 in Mukwonago Wisconsin. Kay teaches ballet, tap, jazz, pointe and hip hop for ages 3 through adult. Students from Kay's Academy of Dance have performed throughout the United States at prestigious venues such as Disney World, New York City, a Caribbean cruise, The Sugar Bowl, The Orange Bowl and The Gator Bowl. Kay continues her dance education with teachers from New York, LA and Chicago. She is happy to share her passion for dance.